Depending on the actor, the aesthetic, their wardrobe and personal preference, the mic element may need to placed elsewhere. 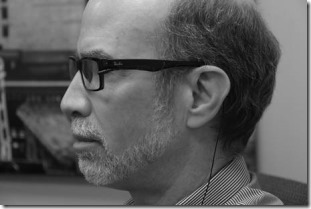 One such example is a bald actor who wears glasses throughout the show. 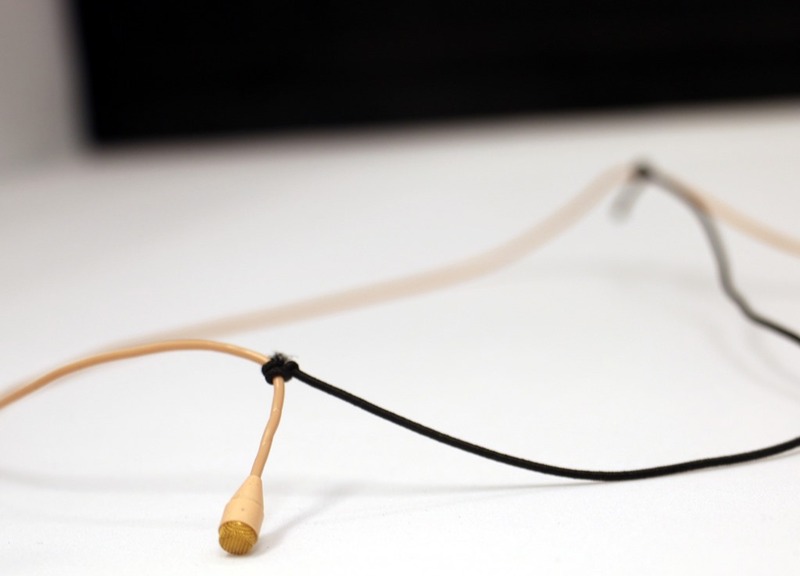 A small mic such as a Sennhesier MKE1 is ideal for unobtrusive rigging on a pair of glasses. and sleeves will help to make the rig more permanent. 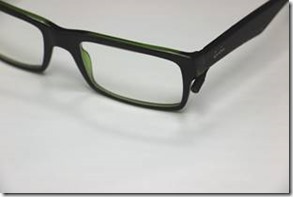 The placement of the mic capsule will depend on the individual, but there are some interesting physics effects that can happen with a pair of glasses. 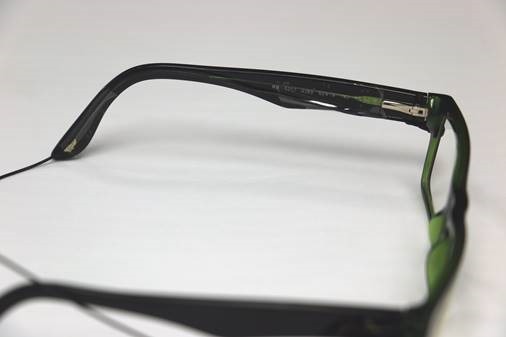 The lens of the glasses can act as a boundary surface, similar to a PZM microphone, that will enhance the high frequency content reaching the capsule. 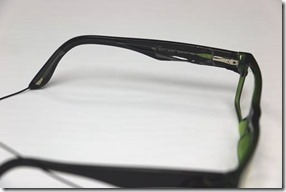 How much the mic capsule sticks out from the edge of the glasses frame will all depend on personal preference. 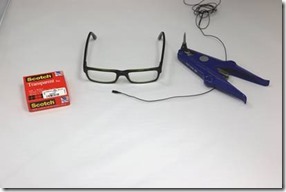 We will demonstrate one way of creating the glasses rig. 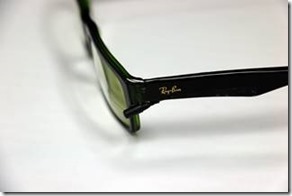 This example simply uses tape along the inside edge of the glasses frame. Check back with Masque Sound for more on sound and the sound industry! If you have suggestions for our team, topics you’d like to see covered, or just want to let us know how we’re doing so far, please reach out! While the halo rig and toupee clip rig are popular means of forehead mic placement in theater production, situations will arise that make these rigs less than ideal or impossible. In these instances, placement may be achieved using the ear, glasses, hat, or other costume accessory. 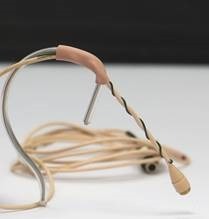 An ear rig is a great placement solution for a bald actor, a character who wears a hat on and off repeatedly throughout the show or if that actor is required to use or move their head frequently, potentially disrupting the forehead mic placement. This rig requires, at minimum, an ear loop to mount the microphone to, Hellerman sleeves and floral wire. In order to help make the rig almost invisible, you will also need art supplies such as paint, markers, stain, and tape. 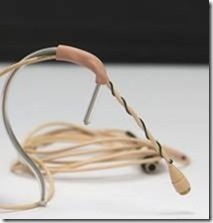 For an ear rig, the mic wire needs to be stiffened in order for the mic placement to remain consistent since the microphone wire itself is used to get the element into position. You start by wrapping floral wire around the mic wire about 2” from the mic capsule. The next step requires an ear loop. There are two types generally used, the metal loop covered with plastic, and the fully nylon loop. 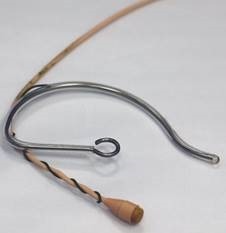 You can also make your own from a coat hanger or other thin metal, but for the price, the pre-made loops can’t be beat. 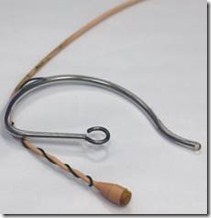 Ear loop use varies significantly among Broadway A2s; some prefer to cut the eye off the top of the loop, some like to have the loop bend completely around the bottom of the ear to keep it in place, some like to bend a straight piece down from the bottom of the loop to make it easier to tape in place, some like to build a small internal armature to make the rig stay in place better on the actor. In this example, we will display the simplest method that is in use on Broadway. 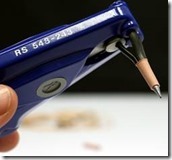 You will need a Hellerman tool and sleeves in order to build this rig properly. If you don’t have experience with a Hellerman tool and sleeves, it may be a bit overwhelming. 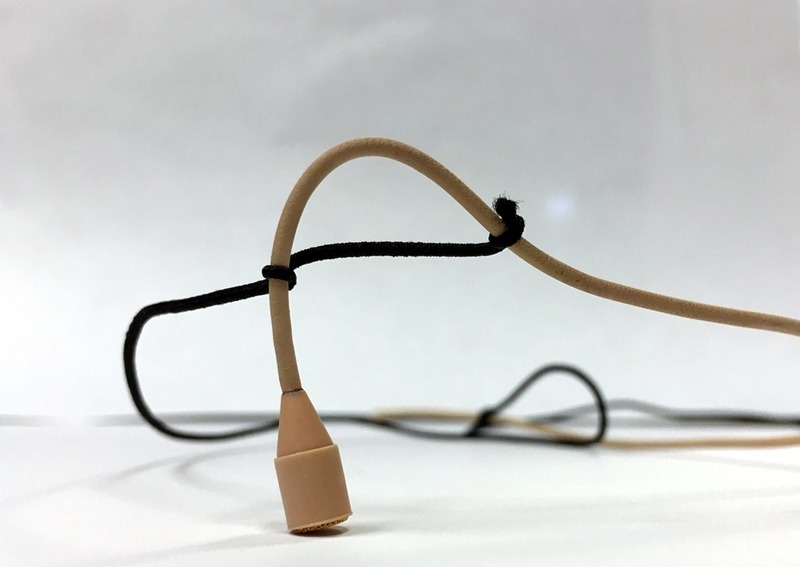 The concept is simple; the sleeves may be stretched over anything that needs a rubberized finish, or to join two pieces together, similar to heat shrink tubing, but much more versatile. 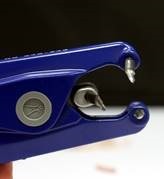 The Hellerman tool stretches the sleeve open so that items can be fed through the middle of the sleeve, then the sleeve is slipped off the open jaws onto the pieces that are fed through. In order for the sleeve to slip onto the jaws in the closed position and make it easy for the sleeve to come off the jaws, use a lubricant. 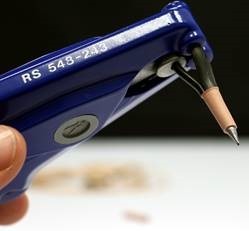 This can be the standard RS Components sleeve lubricant, hand sanitizer, or if you are really desperate, spit. After the jaws are lubed, slide the sleeve onto the jaws and begin opening them up. (don’t pinch the mic wire!). Then gently pull the sleeve off the jaws and onto the rig. The rig can be held in place with a small bit of tape behind the ear over the ear loop. 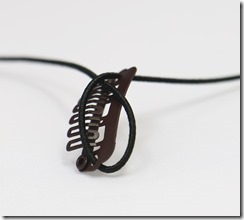 The cable can be hidden and dressed in any number of ways using tape, wig clips or paint. 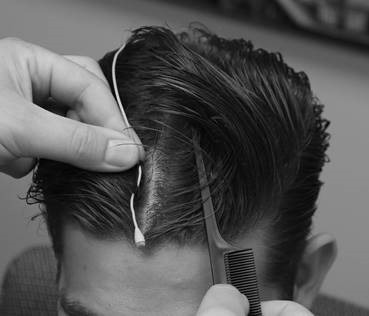 When a halo or toupee clip rig are not sufficient or possible, utilizing the ear rig or an appropriate prop clip is often a viable solution. Tune in next week to wrap up our wireless microphone technique series (for the time being! ), and please be sure to submit any questions, comments, or suggestions to the Masque Sound team! 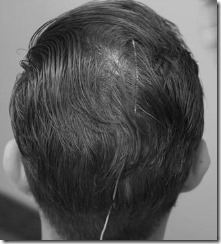 If a halo rig is not consistent enough, or too hard to hide, a toupee clip rig is used. 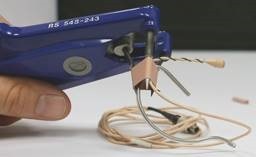 This rig normally uses three toupee or wig clips which attach to the mic cable using elastic and are hidden in the actor’s hair, near the scalp. 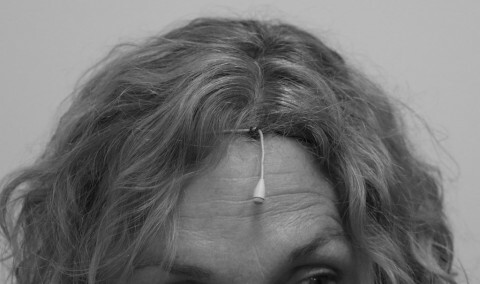 The mic wire is run from the forehead, straight back over the top of the actor’s head, and down the back, hiding the wire under the actor’s hair and costume. 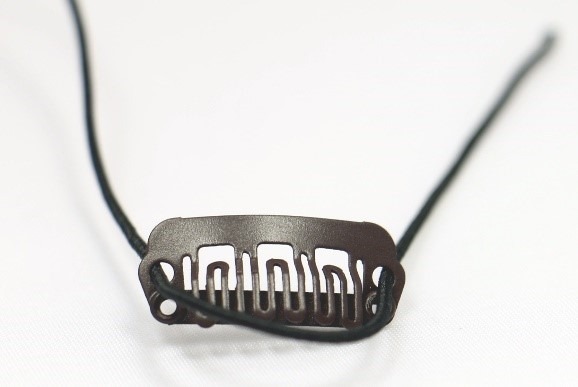 This rig is most suitable on men with longer comb over hairstyles. 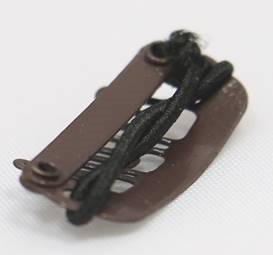 Toupee or wig clips are available in three colors (black, brown and beige) and are made in small, medium and large sizes. 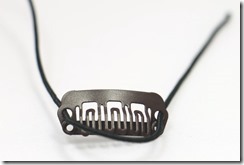 A large clip offers the most secure placement, but is the hardest to hide in an actor’s hair. 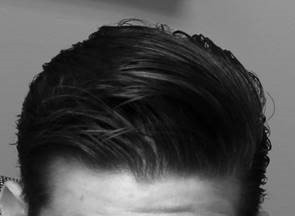 Choose the clip based on the actor’s hair length and color. 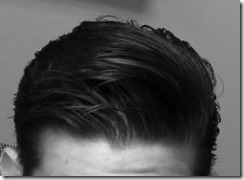 Depending on the actor’s hairstyle, you might use more than one size on the same rig. 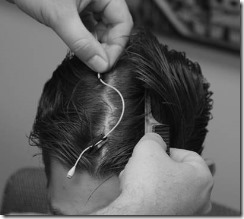 The wig clip can be attached to the mic wire in a number of ways. 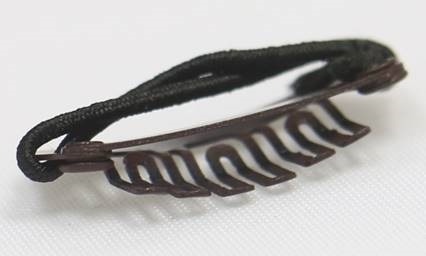 The most common way is with a piece of elastic strung through the holes of the clip and twisted one or more times before tying the knot tight. 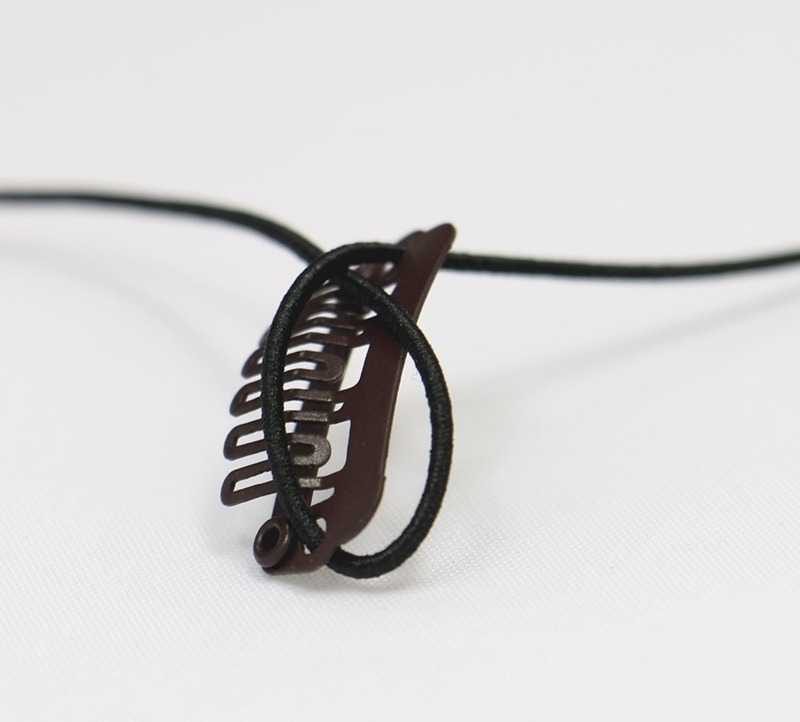 The mic wire can easily be threaded through the elastic twist and it is held tightly, yet offers some movement if the clips need to be slid in place. 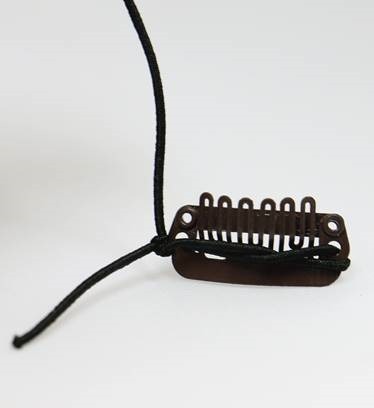 Follow the simple photo series below below to string a wig clip with elastic and install it on the mic wire, then to position and conceal the rig on the actor’s head. 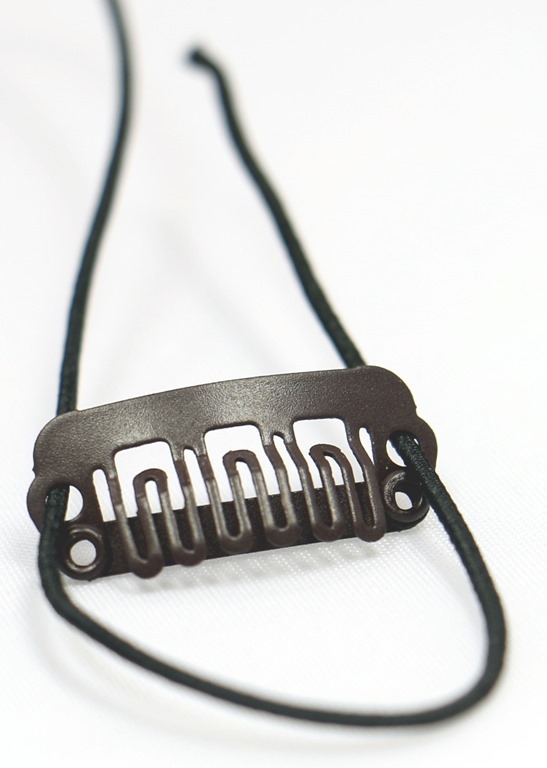 Step One: Loop elastic through the clip ends. Step Two: Tuck one end through the looped elastic to create a twist. Step 3: Tie the elastic, then move to the underside of the clip. 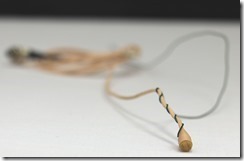 Step Four: Thread the microphone through the elastic so the clip is parallel to the mic wire. the placement perfect and to hide the mic wire sufficiently. 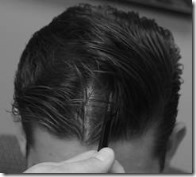 Step One: Using a rat tail comb, create a part in the actor’s hair. Step Two: Once a clean part has been made, drape the mic over the actor’s head, laying the mic through the part. Set the front clip (nearest to the capsule), just behind the hairline. 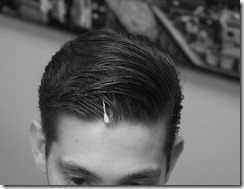 Step Three: Set the next clip on the crown of the actor’s head, avoiding their natural part or any bald area. 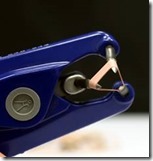 Setting the clip securely is more important than hiding the wire at this point. 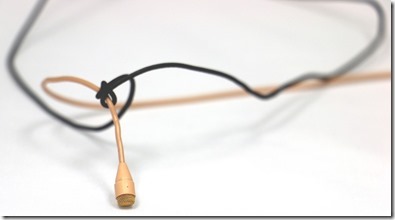 Generally it is possible to slide the mic wire inside the clips after the clips are set. 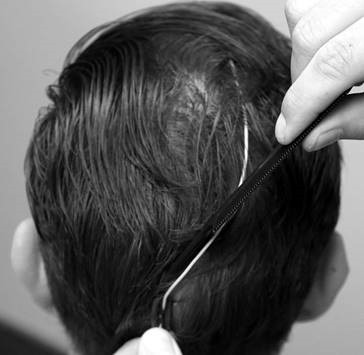 Step Four: The third clip is set on the back of the actor’s head. The placement of this last clip depends on the actor’s hairstyle and can be close to the neckline in the center, or to the left or right of center. Placement will depend on the actor’s and the production’s needs, costumes, and hair style. 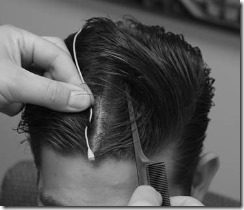 Step Five: After the clip is set, use the comb to pull the hair out from underneath the mic wire in order to hide it. Typically, the mic wire will be colored to match the actor’s hair color, and just the mic capsule will be peeking out from the hairline. The final touch is a piece of tape on the actor’s neck perpendicular to the mic wire to secure it in place. Depending on the timbre and output of the actor’s voice, placement may vary, but this example is a typical placement. The toupee clip rig works well on actors with longer hairstyles, in situations where a halo rig might be difficult to hide, or when the mic rig needs to offer more consistency. 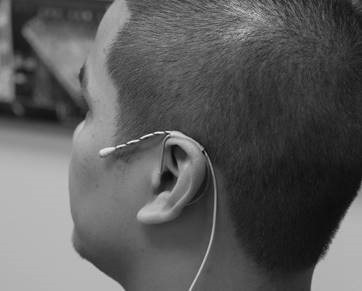 Questions, comments, and suggestions can be sent to the Masque Sound team – our next post will cover mic placement using the ear rig! 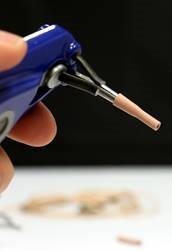 In “Wireless Mic Techniques for Theatrical Production” we’ll investigate commonly used methods in theater for miking actors with wireless elements. 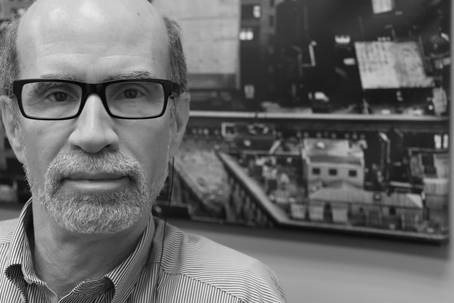 As with much of the knowledge in the theater sound community, documentation is light and information is passed from technician to technician, so consider Masque Sound’s guide just that, a guide. If you have tips, tricks, or suggestions you’d like us to test and add to our guide, drop us a line! When competing with high volume music and sound effects in musicals and plays, vocal reinforcement can be difficult. In order to accomplish the quality and level of audio necessary, actors are often fitted with their own microphone and wireless transmitter when on stage. Keep in mind, softer performances may not require this type of mic placement and those placements will not be discussed in this series. The ideal mic placement on an actor is one that is almost invisible, is not changed by the direction the actor faces, and sounds as clear and consistent as possible. To conceal the microphone and wire, making it almost invisible, a variety of “arts and crafts” techniques are used, including painting, dyeing, taping, and others. In order to maintain the mic’s relative position to the actor’s mouth, the mics are mounted on their head in a variety of positions. Clarity and consistency of sound is by achieved through trial and error – the microphone will respond to variations to each actor’s voice differently. 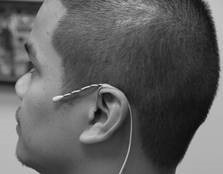 In theater, there are a variety of mic placements, but it is generally accepted that the best sounding placement is with an omnidirectional element on the forehead, just below the hairline where vocal resonance is created from the forehead and sinus cavity. 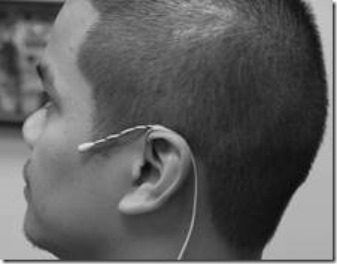 Mic placement as low as the bridge of the nose, and as far to the left or right, directly above the eye is not uncommon. Generally, the closer to the mouth the mic is placed, the louder and closer sounding the audio is. Each actor’s mic placement is situational, with the timbre and volume of the voice dictating where the mic is placed. At times, based on an actor’s, director’s, or wardrobe issues, placement is less than traditional. One such placement is over the ear which relies on the actor’s cheekbone for resonance instead of the forehead/ sinus cavity. 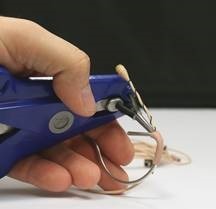 The microphone will peek out an inch or two beyond the ear canal and follow the cheekbone line. If an actor’s costume wardrobe allows, mic placement may be achieved through eyeglass, hat, and lapel mounts, among others. Wireless mic placement could be considered an artform, and responsibility generally falls to the show’s A2, with direction from the A1 and sound designer. 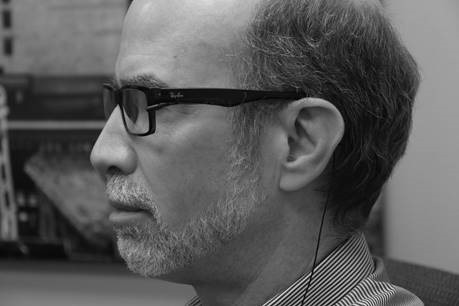 “Wireless Mic Techniques for Theatrical Production” aims to document the most commonly used techniques in an effort to help all theaters and artists produce the highest quality sound and shows possible. 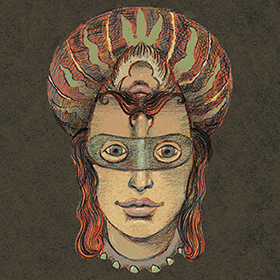 To purchase any of the equipment featured in this series, visit our webstore, and reach out to Masque Sound’s experts with questions and comments! Over the next few weeks, we will be publishing tutorials and descriptions of these methods, so stay tuned. The halo rig is generally used in situations where temporary, less than perfect microphone placement is acceptable, like rehearsals, workshops, and short runs. This is a one-size-fits all approach, is quick and simple to prep, and is relatively easy to conceal on an actor. The halo rig consists of a short (approximately 8″) length of elastic tied to an omnidirectional miniature microphone. 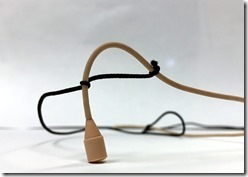 This length is tied on one end just behind the mic element, with the other end of the elastic tied approximately 8″ down the mic wire. Positioned around the actor’s head, the elastic and the mic wire run along either side of the head, forming a “halo” and placing the microphone element in optimal position. This is the final product of the halo rig in the optimal position (for this actor). 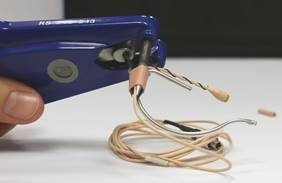 One of the hazards of using the standard halo rig is that if the mic wire used is not stiff, the mic will not remain in place. When the actor inevitably rolls the elastic up or down, the microphone position changes often causing the “unicorn” position pictured below. In this less than ideal position, the mic will point out from the head, causing a different level and frequency response to the actor’s voice causing an inconsistent sound. 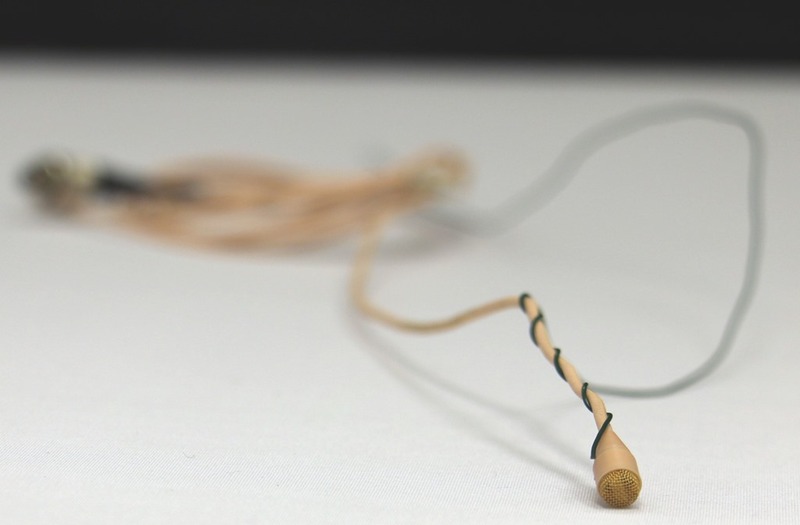 One way to avoid the microphone from shifting is to wrap floral wire around the last 1 ½ inches of mic wire, directly behind the capsule. 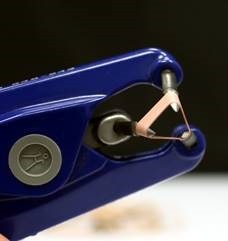 Color the floral wire section of the rig to match the skin tone of the actor with any number of arts and crafts techniques such as paint, tape, Hellerman sleeves or surgical tubing. 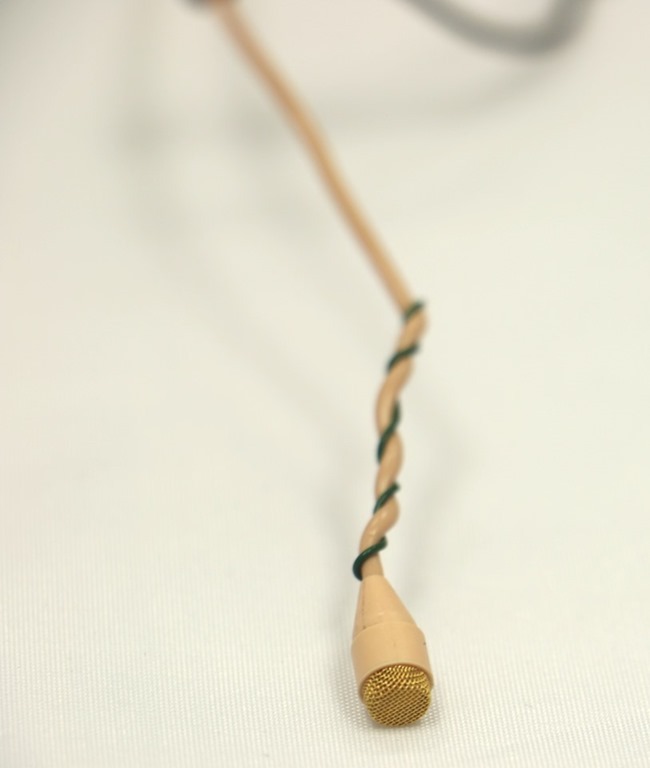 Floral wire adds stiffness to the microphone wire and helps to prevent shifting. 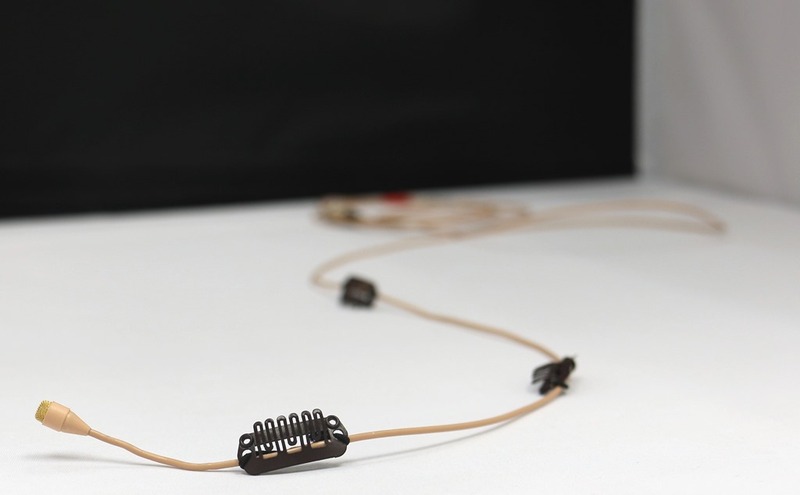 If the microphone wire is too thin, the wire used may need to be less than Masque’s available 24-guage in order to make concealment easier. 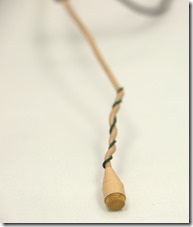 Another way to keep the mic element in place is to add another knot to the rig. This additional knot is placed about one inch behind the front-most one, and the mic wire is bunched up to create small upside down U shape which makes the mic harder to move from the optimal position. This rig may be more difficult to conceal, depending on the actor, but may be more reliable since it is more difficult for the mic to point in a different direction. In the event an actor’s hair is very short on the sides, making the mic wire concealment difficult, the lark’s head knot can be used. 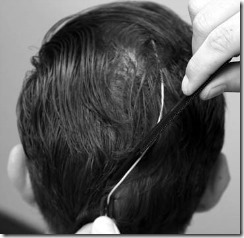 Using a length of elastic, create a loop that is snug to the actor’s head. 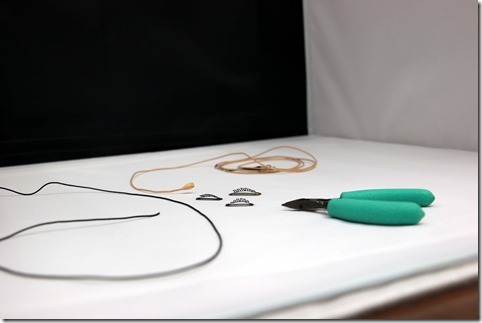 Using a lark’s head knot, attach the mic to the elastic halo. 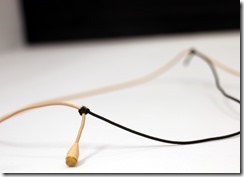 This solution allows similar mic placement, but the elastic may be easier to conceal on the sides than the mic wire. If the actor’s hair is suitably long on top for mic wire concealment, the mic wire can run up and over the crown of the actor’s head and be tucked into the elastic band at the rear. Again, the halo rig is generally well suited for temporary mic placement. Easy to prep and simple to conceal, the halo rig is often used in workshops, rehearsals, and short run situations. 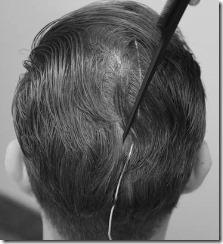 Next week we’ll be discussing an alternative to the halo rig, the toupee clip rig. So be sure to tune in, and as always, we welcome your comments, questions, and blog coverage requests – just submit to our team!